The UK will be self-sufficient in wood fuel for decades to come. JM Envirofuels offers two types of wood chips for heating boilers - recycled and virgin. Both are made to the highest standards and are quality assured. Our wood chip fuel is used by farms, local authorities and businesses of all types as an economical alternative to oil and gas. Many of our customers will also benefit from the Renewable Heat Incentive. Whether it is our recycled chip or our virgin chip, our customers receive the highest quality of product, at the most competitive price and with the best customer service. This fuel is made from clean recycled wood, such as pallets and packaging. It will not contain any treated wood or contamination. 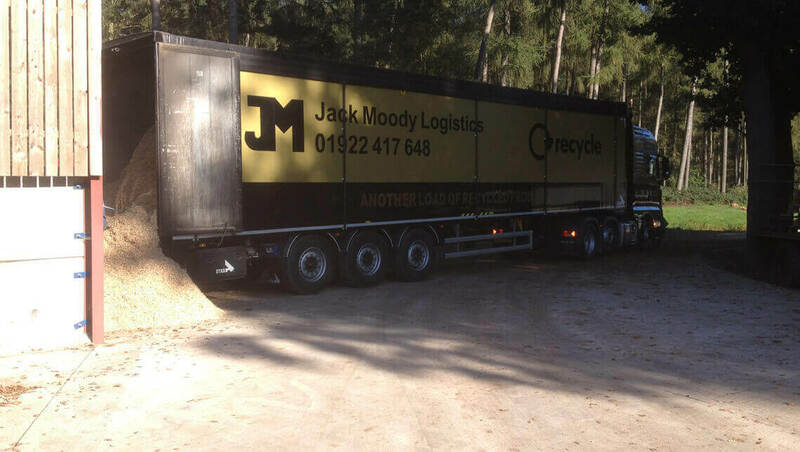 The Jack Moody Group have been recycling wood since 1996 so have the experience and knowledge to produce a high quality biomass fuel from this abundant resource. It has low moisture content, for improved combustion. It is screened to remove dust and fines. It has zero bark content, so low ash production. The wood chips are processed to a particle size P16b (equivalent to the old G30 size), and will have a moisture content of around 20%. It is classified as B2 according to the EN 14961 standard, or Grade A Recycled according to the Wood Recycling Association. We appreciate that this is somewhat confusing for the consumer, but we are pleased to offer telephone advice on its use. We offer virgin chip fuel for customers who prefer it. It is made from conifers grown in the Midlands and mid Wales. Our long standing agreements with local forest owners, manager and forestry contractors ensures a steady and reliable supply of timber, from sustainably managed woodlands. It is also processed to a particle size of P16b, and will have a moisture content of around 25%. It is classed as either A1,A2 or B1 according to the EN 14961 standard. All our customers will be assigned a dedicated Account Manager who is the main point of contact at the company. He or she will deal with any query and will provide technical support, including site visits, should the need arise. We can deliver the fuel via 30 cubic metre (approx. 7 tonnes) blower or tipper, or by 90- or 100 cubic metre (approx. 20-22 tonnes) walking floor artic. We can also accommodate hook lift bin stores with our hook lift lorries. Blown wood chip delivery offers particular advantages for the customer. Because we can blow the chips along a flexible hose, up to 15 metres, fuel stores can be constructed very simply and relatively cheaply when compared to excavated underground bunkers. For other customers, it removes the need to manhandle chips. Because of our blown wood chips capability, a number of customers have converted from pellets to chips, thus making significant cost savings. JM Envirofuels is one of only a few Midlands wood fuel suppliers to offer this service. Whatever delivery method is used, our vehicles are modern and clean, with friendly, knowledgeable and helpful drivers backed up by an experienced transport management team.